The following is a press release related to exciting news about a community sponsorship! As the Etobicoke Sports Hall of Fame celebrates their 25th anniversary, they have signed a five-year sponsorship agreement naming Great Lakes Brewery (GLB) the “Official Beer” sponsor of the Etobicoke Sports Hall of Fame. “We are absolutely thrilled that GLB will be our Official Beer sponsor. As is our Hall, they are community driven and have been part of the fabric of Etobicoke for over 28 years. The GLB culture is such that they are all about supporting local organizations and businesses, not to mention the delicious craft beer they brew,” says Joanne Noble, President of the Etobicoke Sports Hall of Fame. 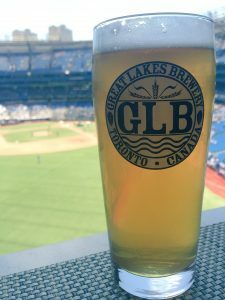 “We have been part of the Etobicoke community since we moved our brewery here in 1991,” said Peter Bulut, Owner and President of GLB, “and we are extremely proud to link up with the Etobicoke Sports Hall of Fame for all of their fundraising efforts over the next five years, offering fresh craft beer for all events. Supporting local organizations that continue to elevate our community continues to drive us forward,” he added. The Etobicoke Sports Hall of Fame Scholarship Program is sponsored by Scotiabank and Humber Valley Hockey Association. Each year six student athletes from Humber College, three student athletes from Etobicoke high schools, and two Special Olympics athletes from Etobicoke are awarded a $1000 scholarship to help further their education. “The GLB sponsorship will really help offset the expenses of our main fundraising events which will help our bottom line immensely in turn helping to sustain our scholarship program” says Noble. The five-year agreement commences immediately with the first of many fundraising events slated for April 25th at the Mastercard Centre. GLB will be on-hand with a variety of brands that will be expertly paired with an assortment of cheeses. The Etobicoke Sports Hall of Fame was founded in 1994. The original mission statement was to recognize and honour athletes, builders and media personnel in our community who have achieved the highest standard of excellence in sport and who have made a difference in young people’s lives. As we celebrate our 25th anniversary, the Hall and our mission statement has evolved to include a vision and core values such as respect, community, integrity, education, inclusion and equality. The Etobicoke Sports Hall of Fame is very much an important part of the social core and the fabric of the Etobicoke community and after 25 years, the Hall continues to live up to its mission statement, and has earned the ongoing support required to continue with its endeavours. 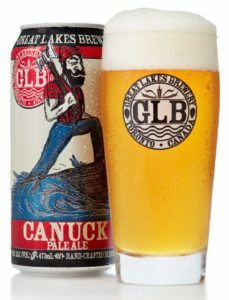 A fiercely independent owned and operated brewery, Great Lakes celebrated 30 years in the craft beer business in 2017, making them one of the oldest craft breweries in Ontario. GLB specializes in producing flavourful beers that will be sure to awaken your taste buds with each sip. From unique seasonal ales and premium lagers to our 7 Barrel and Tank Ten Series of beers, we produce a variety of products to be enjoyed by everyone! 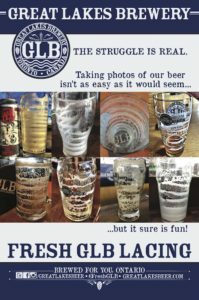 Based in Etobicoke at 30 Queen Elizabeth Blvd., GLB invites you to visit the brewery for a taste of award-winning beers in their bustling taproom and retail store 7 days a week. While there, enjoy food from The Wavy Wall, GLB’s in-house craft kitchen.